(a) Make sure that the CD is an audio CD or a CD with an MP3, WMA or AAC files, and that it is not deformed, flawed, stained, deteriorated or otherwise defective. MP3, WMA and AAC files on CD-ROMs, CD-Rs and CD-RWs can be played. For details on playable CDs, refer to Owner's Manual. (a) Check the CD is inserted upside down. 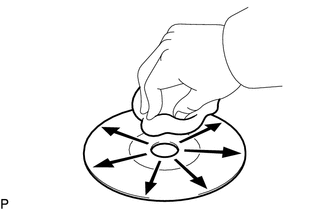 (a) Clean the CD by wiping it clean with a soft cloth from the inside to the outside in a radial direction. (a) Replace the CD with a new or known good one and check that the malfunction disappears.